Standing on a semi-dusty lane, outside the gates, in a circle, we listen to Ruslan as he invites us to his country, his home, and how happy he is to have us here. This is one theme you always come across in Kyrgyzstan – the love for the country first and everything else follows smoothly. Dressed in a blue shirt, brown embroidered trousers that are partly covered with knee-high boots, a half-jacket with traditional motifs held together with a wide metal clasped belt and the ak-kalpak (a tall felt hat), his eyes and voice soften as he tenderly starts talking about his eagles. We enter the immaculately kept garden and shrill screeches fill the air. Three eagles with their talons tied under the trees and eyes covered under the hoods designed to keep them calm from distractions, immediately sense a foreign presence and start bawling in tandem. Ruslan puts on his sheep-skin gloves and allows one of them to perch on his arm. 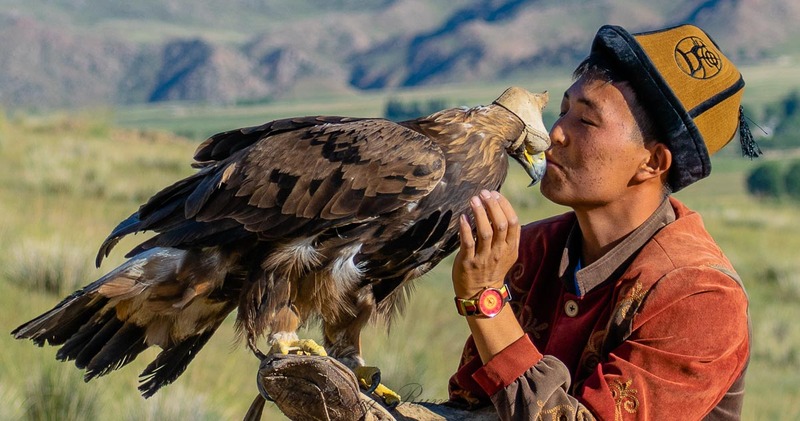 Talking to the eagle like a baby, he tries to soothe her – yes, for the purposes of hunting, it is the females that are bred and trained and considered the most skilled hunters. Ruslan introduces Karabarchin to us, she is 3 years old with a wingspan of 5 feet, hazel eyes, sharp beak, and golden-brown feathers with a hint of white patches underneath that indicate that she is still very young. These eagles are taken from the nests as fledgelings and reared to be hunters for small to medium-sized games that range from rabbits to foxes. 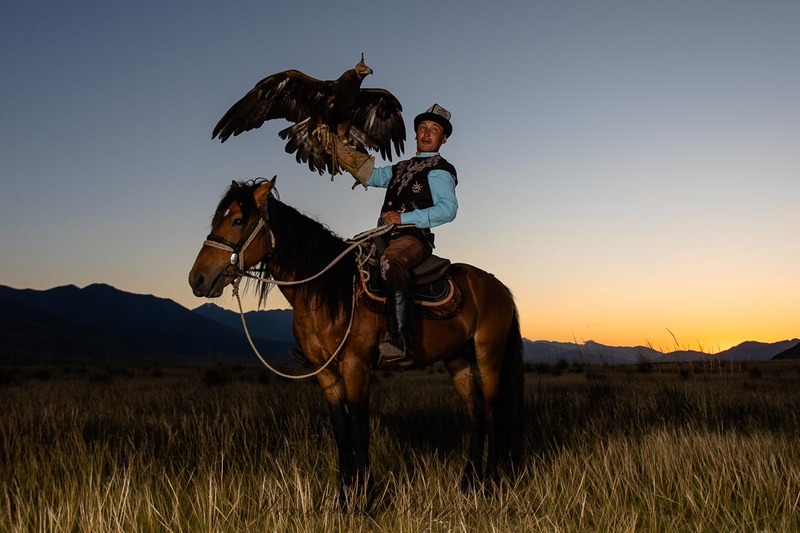 In the Kaji-say area of Issyk-Köl, the falconers, called munushkors in Kyrgyz, are handed down this art from generation to generation. Ruslan learned about training eagles in his teens from his father and has been practising this for 15 years. 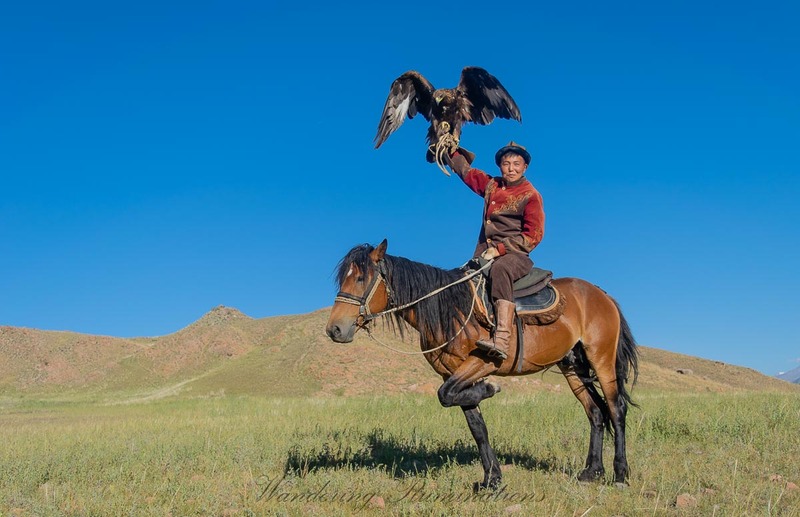 The munushkors keep the eagles until they turn 12-15 years old and are then released into the wild. Ruslan explains that there is a proper weaning process as well. 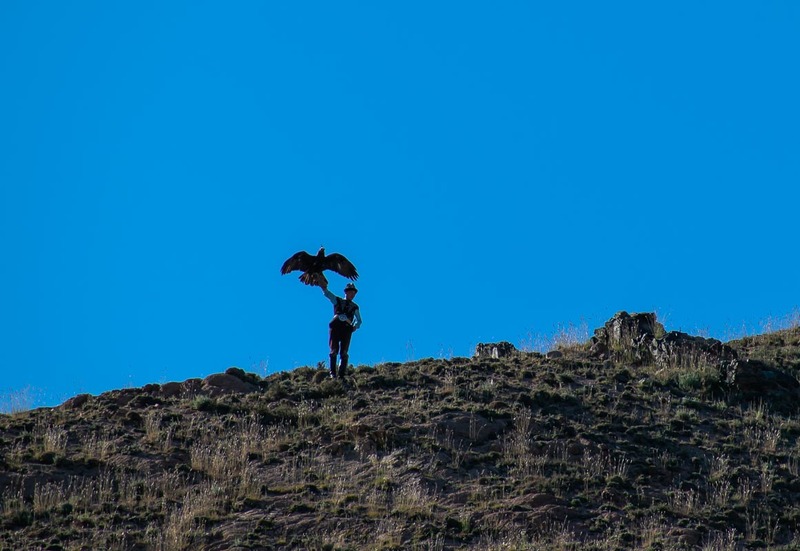 A few years before they are to be released, the falconers start maintaining their distance with the eagles to make the release easier. The emotional bond is quite evident in the way he talks to his eagles asking them if they are feeling uneasy and afraid with outsiders around them and that they should not worry because we have come only to admire them. We leave with a drink of Maksim – fermented ground wheat – for a rendezvous with these magnificent creatures later in the day. 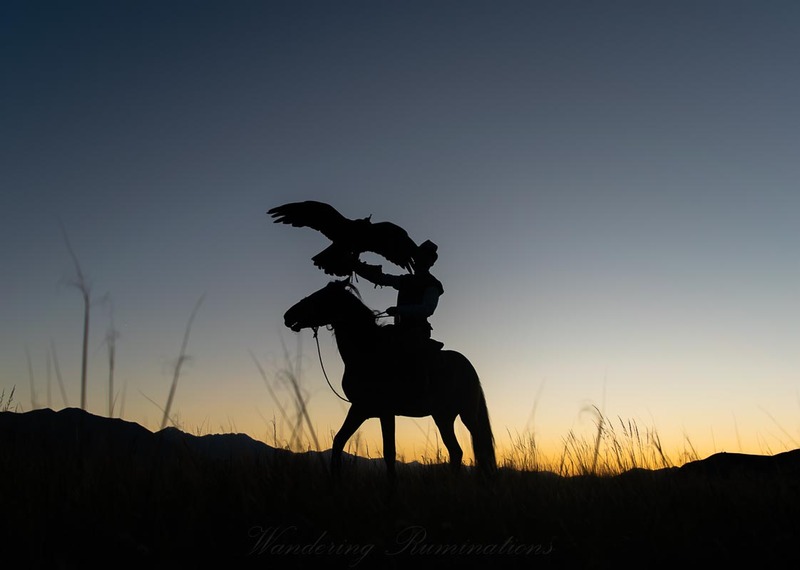 Before the sun starts its descent, Ruslan along with Karabarchin and another falconer Akylbek with his eagle Karakoz arrive at the open grazing pastures surrounded with snow-capped mountains to give us a glimpse of the hunt in action. 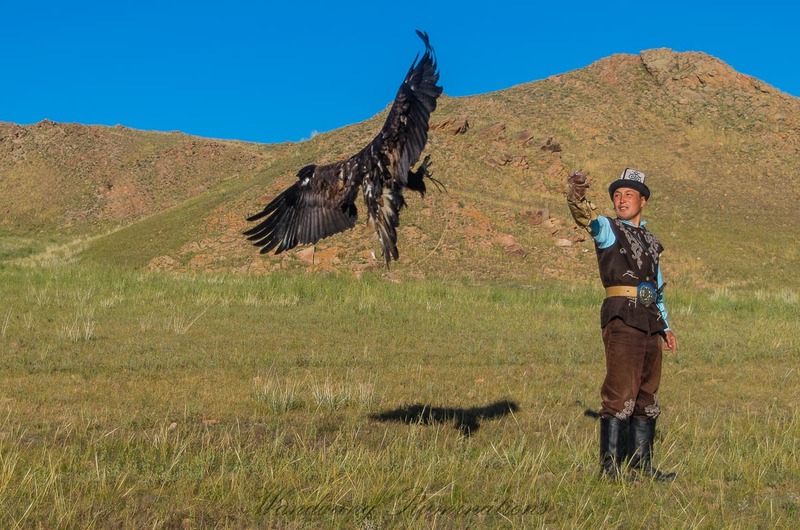 Akylbek is still in his teens and has been training for 3 years – less experienced, but in no way any less connected with his eagle. They both proudly show off their eagles by raising their arms and the eagles in response, spread their wings, towering overhead, to paint a wonderous and formidable picture. A slight chill in the wind picks up, rustling around the grassy knolls. Ruslan starts by removing the protective hood from Karabarchin’s eyes and with her perched on his arm, starts climbing the hillock behind us. The bird easily weighs 5-6 kilograms but with the ease and deft that he manages to balance her while making the steep ascent is remarkable. On reaching the summit, a signal is given by Akylbek who has placed a carcass of a hare a few feet away from us. Ruslan releases Karabarchin and with a swooping motion, she leaps towards us. Starting her descent, she spots the prey on the ground and gathers speed. Before the landing, a loud flap of the wing overhead is accompanied with a skilful twist of the talons as they come forward to clasp the prey on the ground. Continuing the flap, the hare is picked up and dragged to ensure that it can’t run away (it takes the poor thing a while to realise she has been tricked!). 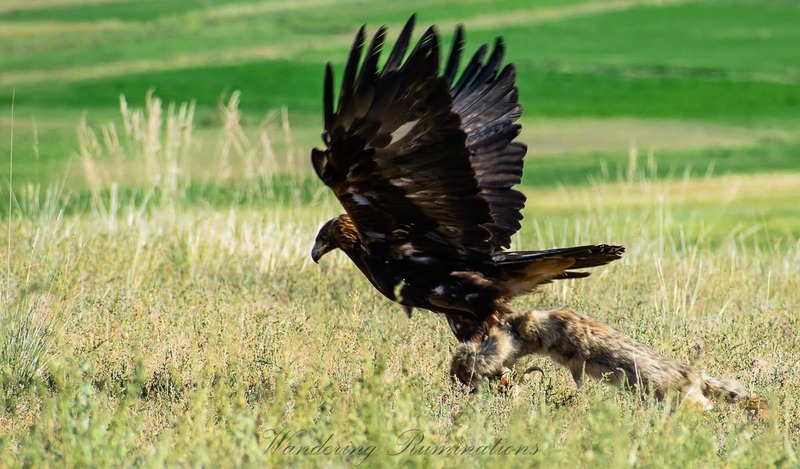 With both the talons secured tightly on the hare’s neck and back, Karabarchin looks around for Ruslan, who has by now run down the hillock and is by her side to offer her a piece of meat as a reward. Before the next exercise begins, we stand to talk again. Ruslan has been carrying a small dagger attached to his belt. The wooden hilt is carved in the shape of an eagle and he explains that sometimes when the game is big, like a fox, the munushkors use the dagger to assist in the hunt and make the final clean kill on behalf of their eagles. The bond and deep connection that these men share with these creatures – who at the end of the day are predators – is incredible. Ruslan climbs the hillock again and releases Karabarchin, who starts to circle high up above us against the blinding blue sky. Running down the hill, he takes his position in the middle of the Jailoo, holds out a piece of meat in his hand, and starts calling out to her. She keeps circling overhead. It is almost like a game they play for the next few minutes. Surveying, gliding, and letting out her shrill cry, with each call, Karabarchin descents a little lower but does not stop circling around. Finally, as if on cue, when the call from Ruslan goes a pitch higher, she swoops in with a swoosh of wings and with her talons pressed forward, lands on his arms in one swift motion, retrieves the piece of meat from his fingers and starts to nibble on it. As the sun starts to set, we get an opportunity to hold these magnificent eagles on our arms as well. And just as calmly as they were perched on Ruslan or Akylbek, they accept us too. There is a piercing gaze from them, almost like they can see through the soul and it is a feeling I will not forget anytime soon. This was an experience I could not have ever dreamed of, yet it left me with some beautiful insights into the art of loving, letting go, and being gentle even when the world perceives otherwise.